On the show ''First Dates - O Primeiro Encontro'' (https://trakt.tv/shows/first-dates-o-primeiro-encontro). Episodes 1x16 to 1x33 are wrong and don't exist. That's why they are called '**** PLEASE DELETE ****'. I tried to put change it on TVDB as you can see on this forum thread (https://forums.thetvdb.com/viewtopic.php?f=7&t=53918&p=144624#p144624). But no one responds or does something. And it's frustrating to have the show showing episodes that don't exist. 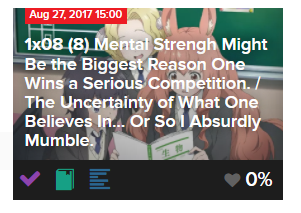 We’ll need TVDB to remove the episodes before we can. I removed the 3rd once since it wasn’t on TVDB. The first 2 however exist on TMDB and TVDB. They’ll need to be removed there before I can remove them. but all the previous episodes (from the former network) are shown as been aired on Netflix. So at the moment data is incorrect and it changes the values in Year in Review for example. I have Trakt VIP and access to Advanced Filters. I can filter shows via parameters like 'network' or 'watchnow', that are appended to URL. Would be possible to support similar advanced filtering for lists. I tried adding same parameters to URL, but it didn't work. (some UI could be usable, but support for URL should be easier and faster to add). Planning to add URL filtering first, then eventually UI. I need to find a way to do that without further cluttering the list UI. There have been numerous movies I've found that may be in the process of being made, but somehow they get a bad release date, and then they show up in my feed. It'd be nice if there was a "report inaccurate information" link. I've already tried the "Refresh Data" link a week or two ago, and nothing happened. That is a shared style so other places could have the same issue.